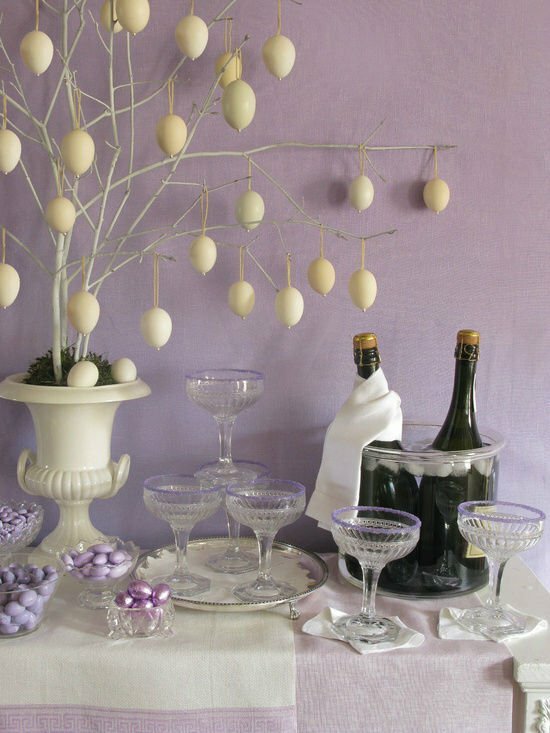 Easter is a festival time when people celebrate, eat, drink and decorate. Decoration is the most important thing of the Easter celebration which takes a lot of time and planning. The decoration of the dinner table is one of the most important element because decorating the house is not as difficult as decorating the dinner table because of limited space and limited décor ideas and items. Also, Easter dinner is about much more than just food. The elegant and beautiful Easter table decorations and centerpieces are the perfect way to prepare for the get together. You can mix and match up the ideas for the dinner table display or can use them as a guide to create your own look. By styling ferns, eucalyptus, anemones and moss covered eggs on burlap, get the flower filled and a rustic look display. 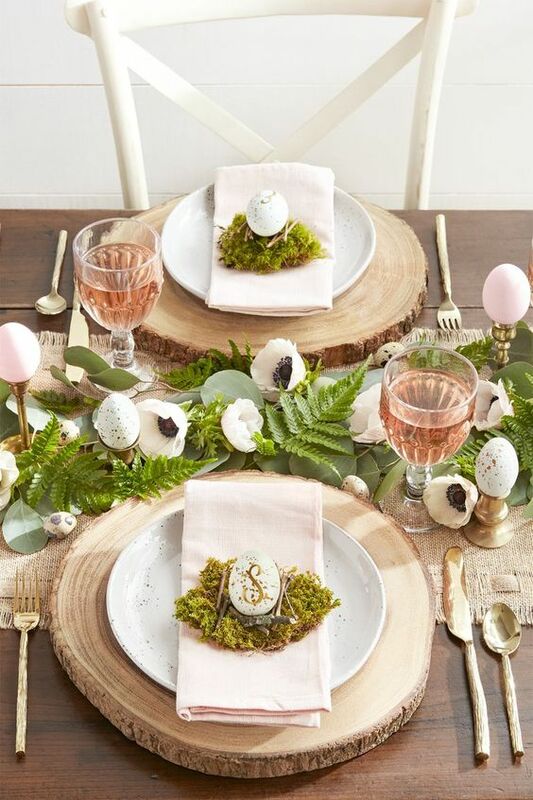 You can also use moss piles, monogrammed eggs and wood slabs for an elegant touch. By using a small paint brush to fleck tan acrylic paint on undyed farm eggs, you can create some personalized Easter eggs. Finally, handwrite the initials of the guest’s name using a gold paint pen. 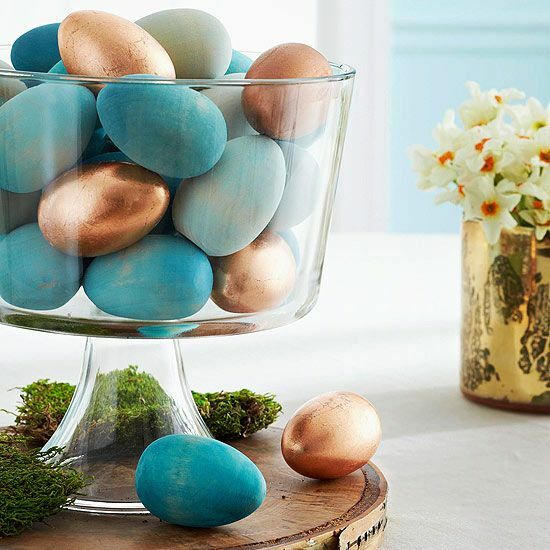 For this idea, you can use leftover dyed eggs and transform them into bright colored candle holders. 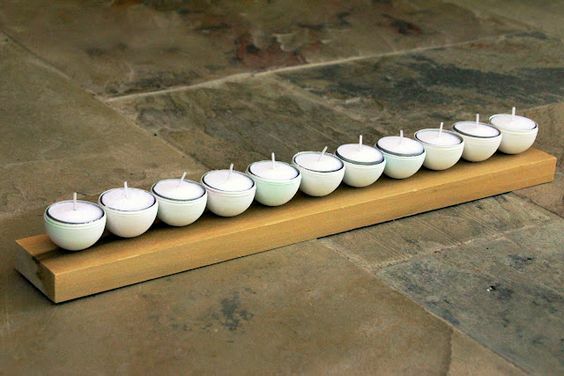 Once the decoration is done, scatter them throughout the dining table or atop the mantel for a fresh Easter decoration. 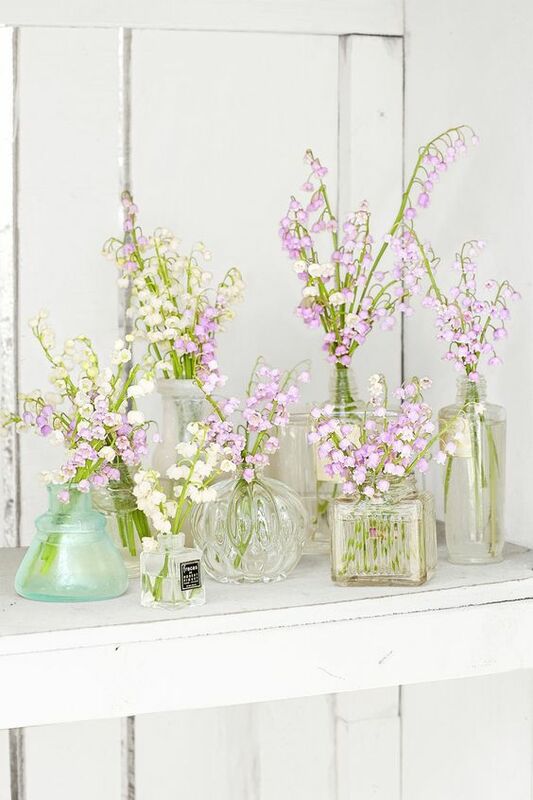 You can also use vintage perfume bottles and fill them up with fresh spring flowers to decorate the dinner table. 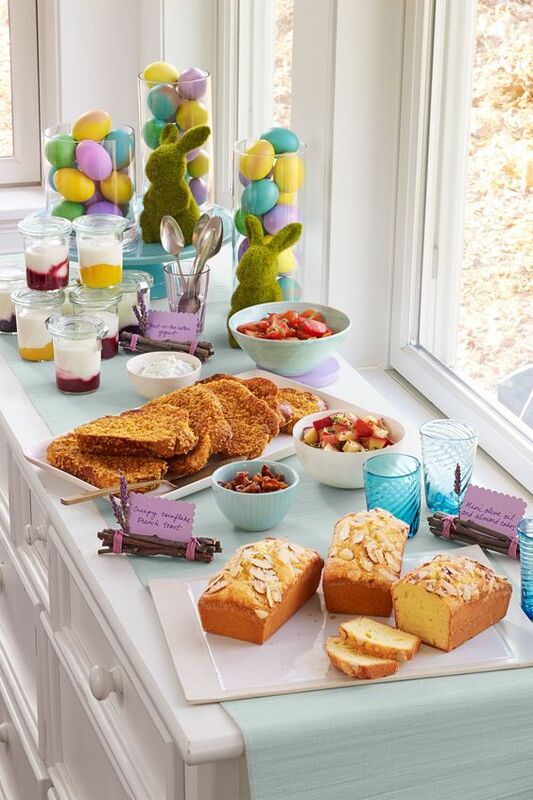 An Easter table which is homemade is the star of the spring table. 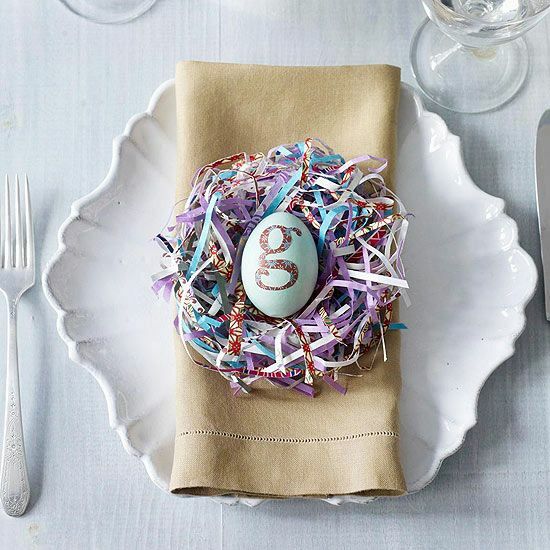 The burlap Easter decoration gets ready in minutes and can be customized to fit the color scheme. 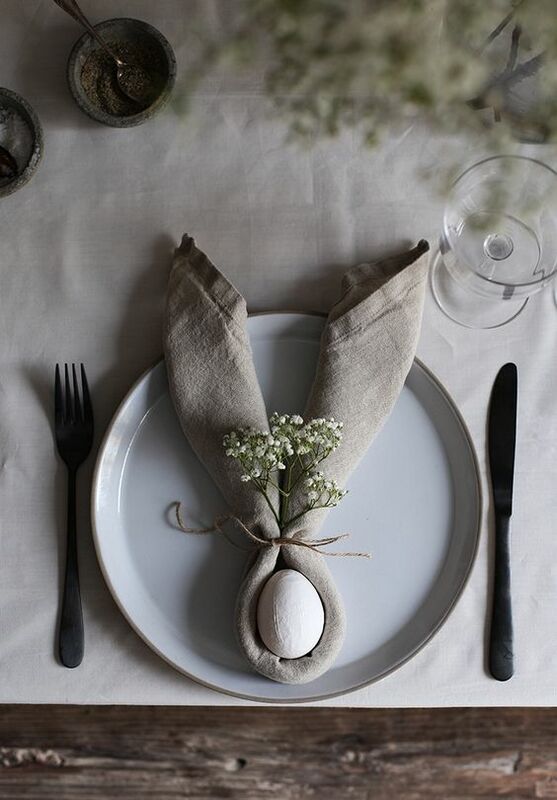 You can create few decorated Easter eggs and then add fresh flowers to make your table dinner ready. 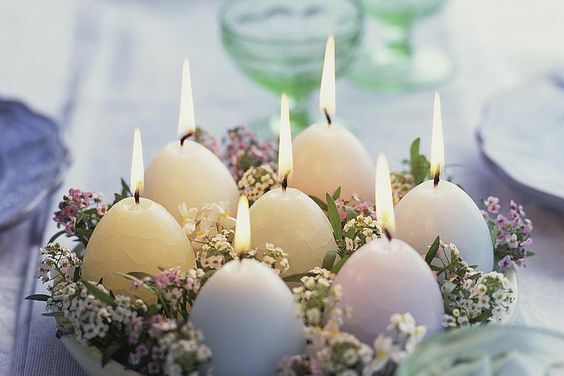 This decoration idea is made from the ingredient which is found around the home easily and that is what makes it natural because it uses egg shaped candles for setting in the mood. Let go off the plain white decoration idea for a mix of fresh motifs and colors. Use layered decoration with lavender touch but also try to keep the classics on such as silver flatware which can ground even the most contemporary scheme. It is almost not possible to have a lot of flowers so here we can give each Easter guest a floral wreath around his / her plate to decorate the Easter dinner table and then decorate it with matching ornaments and other florals. 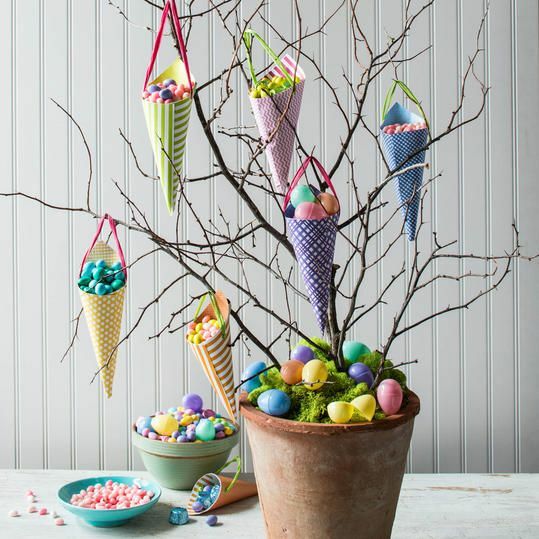 Variety is the beauty of Easter decorations which can be both subtle and elegant or bright and bold. Prepare a napkin bunny ear and decorate it on each plate on the dinner table. 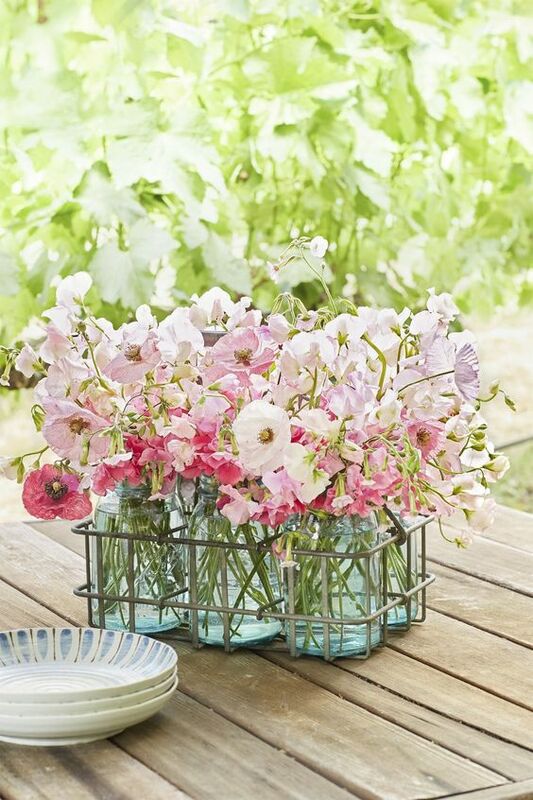 Create a rustic flair to the floral centerpiece by converting milk jars into a vase and bundling it up with twine or string and finally filling it with the flowers. 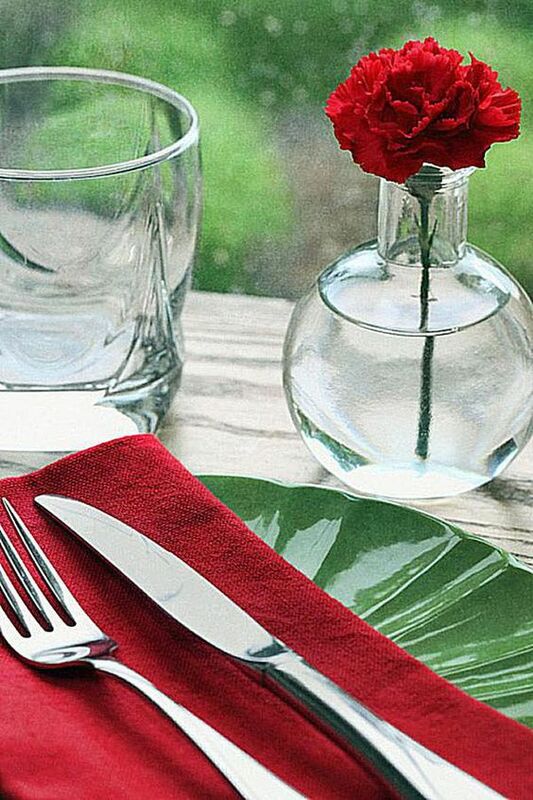 Decorate the vase on the dinner table and impress your guests with your DIY skills. Unlike milk jars, you can also use Mason jars to create one big floral arrangement for your dinner table and decorate it as a table center piece of an Easter dinner table. 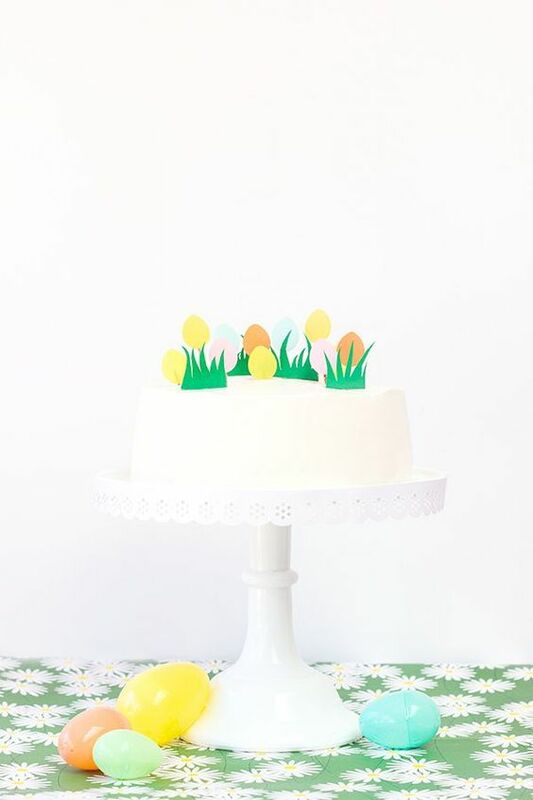 With a beautiful yet a simple cake topper which can be made at home using card stock and paper punches, take your plain cake from basic to beautiful. 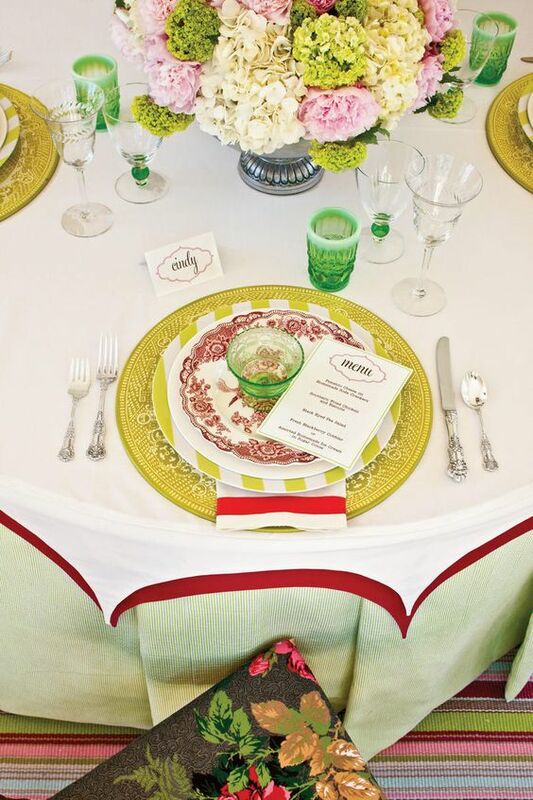 To create a fresh as spring table setting on the dinner table, use a patterned paper plate. 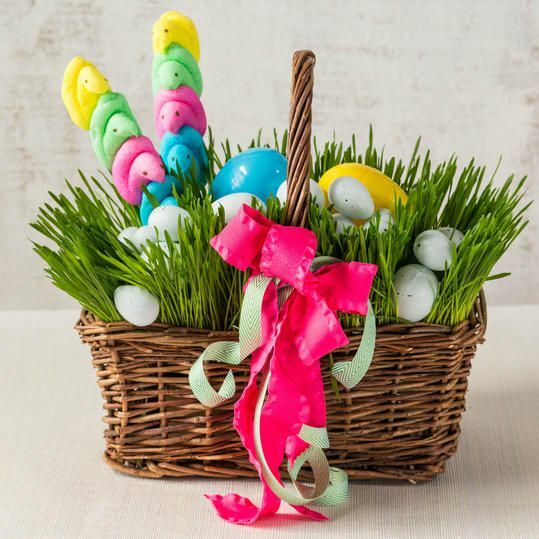 Make a basket by flipping the square plate over and fill it up with chocolate rabbit and paper grass and then craft a disposable placemat from a wrapping paper and affix with double sided tape under the strip. Get the measurements according to the size of your plates. This idea is for the kid’s table where you can choose color combination of your choice and create a beautiful candy land. Use oversized lollipops as edible flowers by pairing with scrapbook paper petals and plant in the buckets filled with grass green jelly beans. You can also use ducklings name card holders to let the little ones know about their seat. 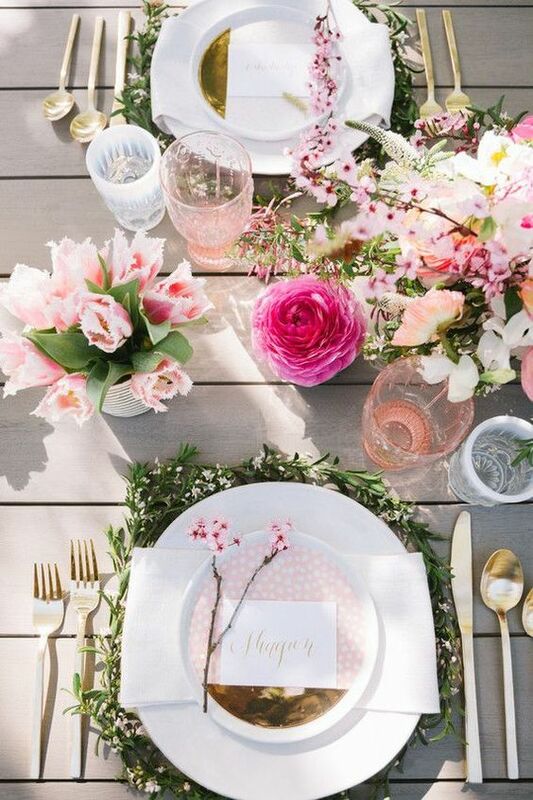 To inspire your celebration table, allow in some fresh flowers and spring’s pastels. 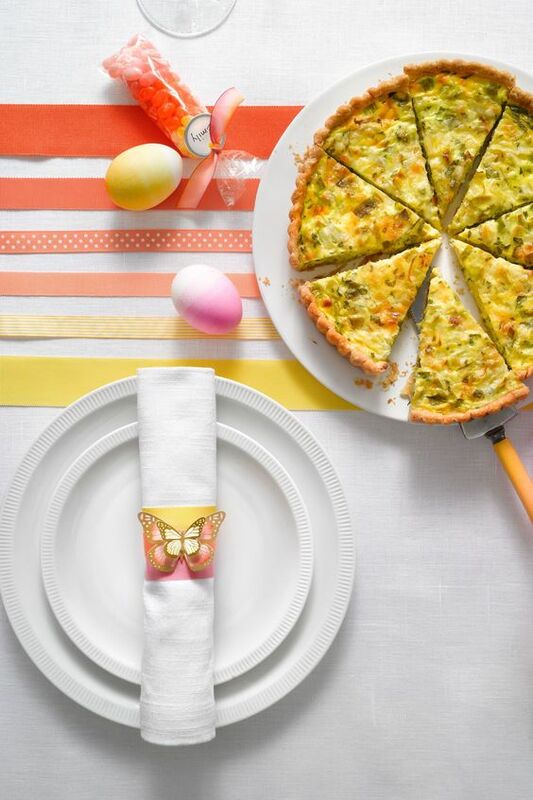 Use a rabbit ear napkin ring which you can make from felt and add it to each plate setting and finally add few sweet chicks and bunnies around the table. Bundle up few twigs by using a colored twine of your choice which matches the surrounding and write down the name of the dish on a card stock and slide it along with a sprig of lavender between the two top twigs. Cut the ferns and display it in glass cloches to welcome the spring season on the dinner table. Under the ferns, you can pile a bit of dirt and moss and match it up with a fresh fern sprig on each plate setting. The green and red colors are no longer for Christmas as they are now in use to decorate an Easter table too. According to Christians and their beliefs, red and green colors represent the blood of Jesus and a new life, respectively and when white the color of purity is added to red and green the setting becomes elegant and beautiful. 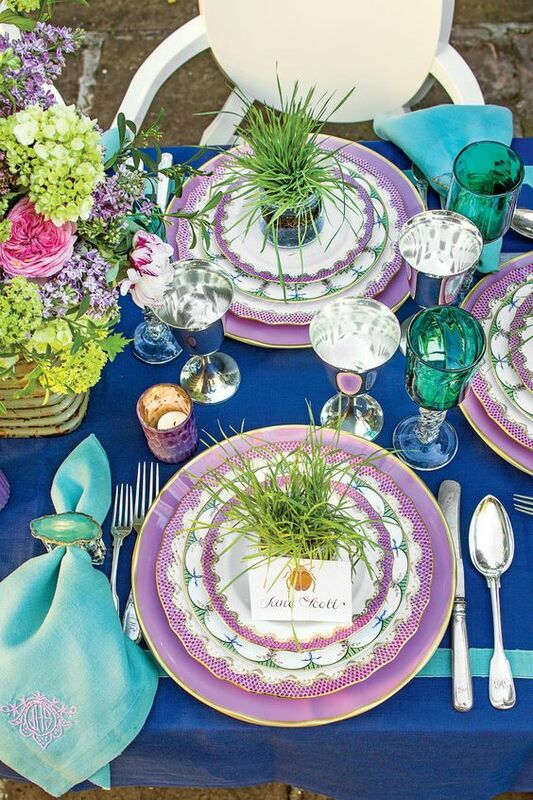 Use all 3 colors to welcome the Easter and your guests on the dinner table. For saving money, use every day dinner ware and reinvent them rather than buying anything special. 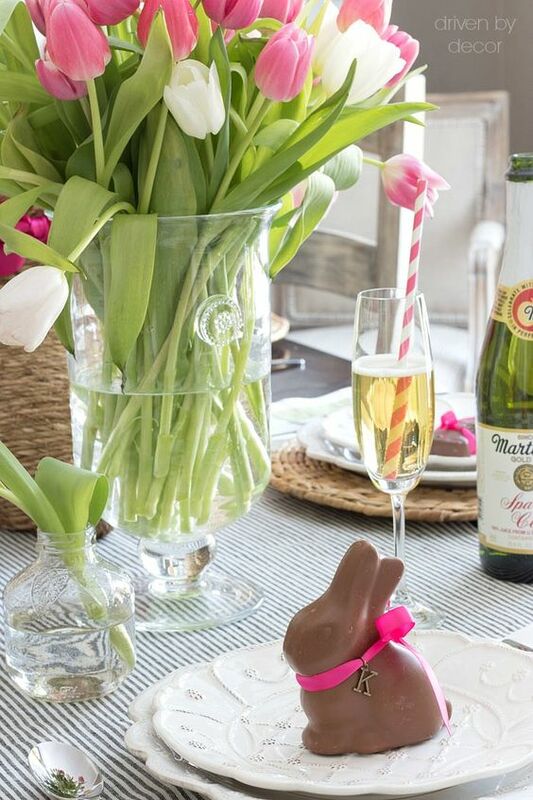 Use bunches of tulips or your favorite flower to brighten up the simple Easter tablescape along with chocolate bunny place cards marking each spot. You just have to arrange ribbons in the palette you like along the dining table and trim them so that around 1 foot hangs over the either ends of the table. Use pieces of double stick tape to keep the ribbons in place. Make your own Easter buffet table look and smell fabulous by placing spring flowers like paper whites and primroses in some vintage cans of metal. You can also create a table top garland by color copying vintage chicken images on card stock and joining them with ribbon. For this idea of a sophisticated, clean look use glass hurricanes atop ruffled cake stands and fill them with white eggs and crisp white tulips. 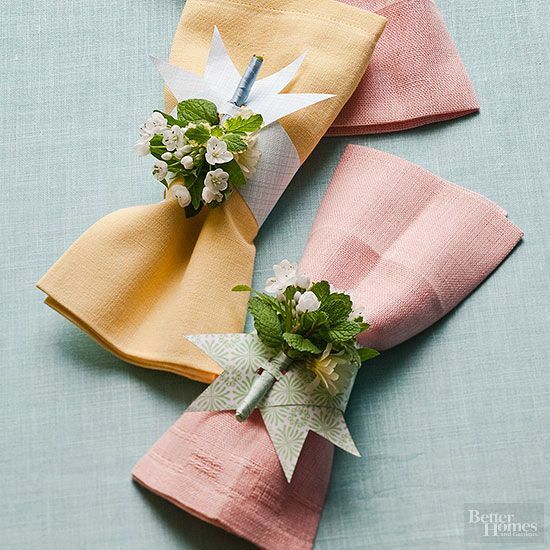 To dress up the presentation of your Easter dinner table, use elegantly wrapped napkins. Gather some little posies of flowers and herbs and wrap stems with ribbon to secure. Cut a strip of paper of about few inches depending on your own choice, notch the ends and cut 2 slits from each end and finally slip the posy stem through the slits to hold in place. 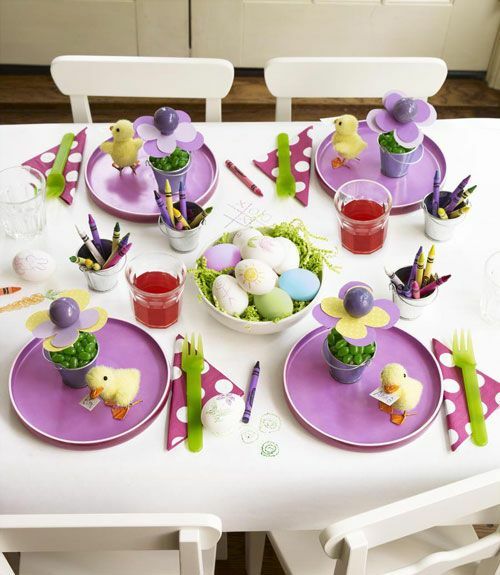 Colors like yellow and purple create a wonderful combination for the Easter dinner table idea. 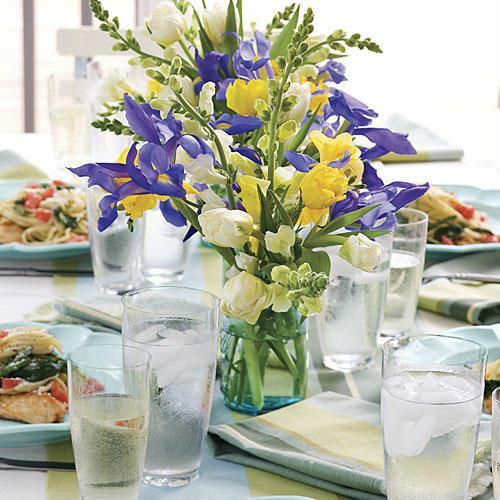 Yellow tulips, white roses and purple irises in a glass vase will make a perfect style statement for the party décor. 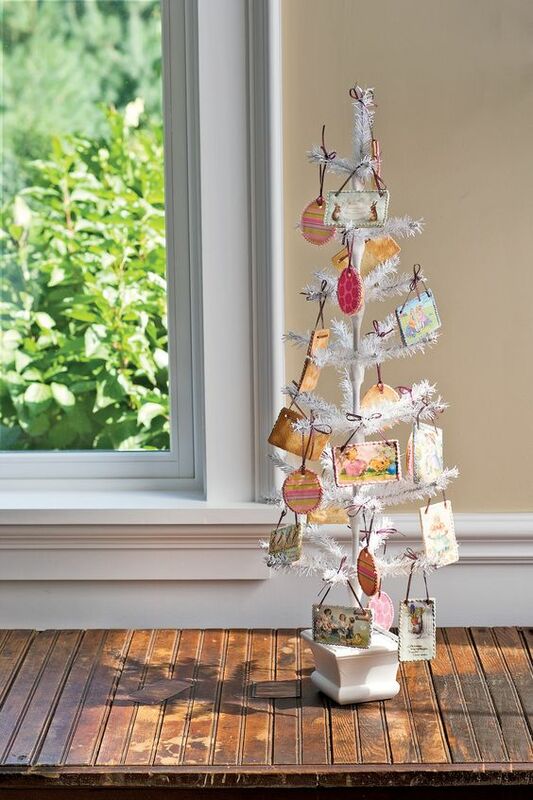 Ornaments and trees are not reserved to just Christmas anymore so now you can use it for the Easter décor too. Use it on the dinner table or on a kitchen counter, everyone will love to pluck one or more cookie ornaments from the Easter Tree. 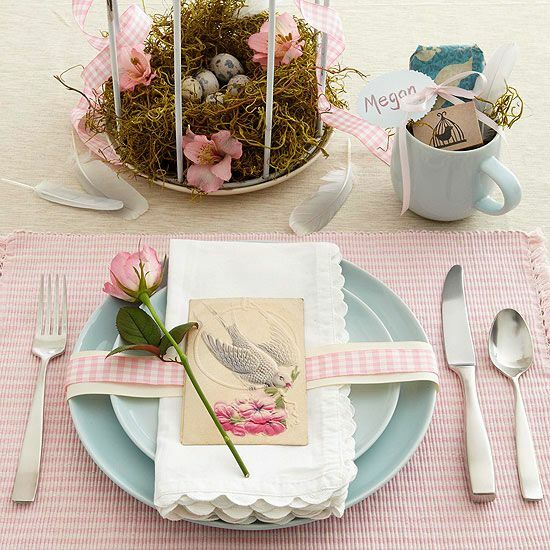 With a paper strip nest, create a place setting that gets undeniably Easter. Use colored scrapbook papers and shred items in tiny strips. To fit an egg, form the paper strips in a large ball and then in the center of each ball, place an egg forming the strips into a nest around the egg. Finally, with a monogram sticker let each of your guests know where they are supposed to sit. 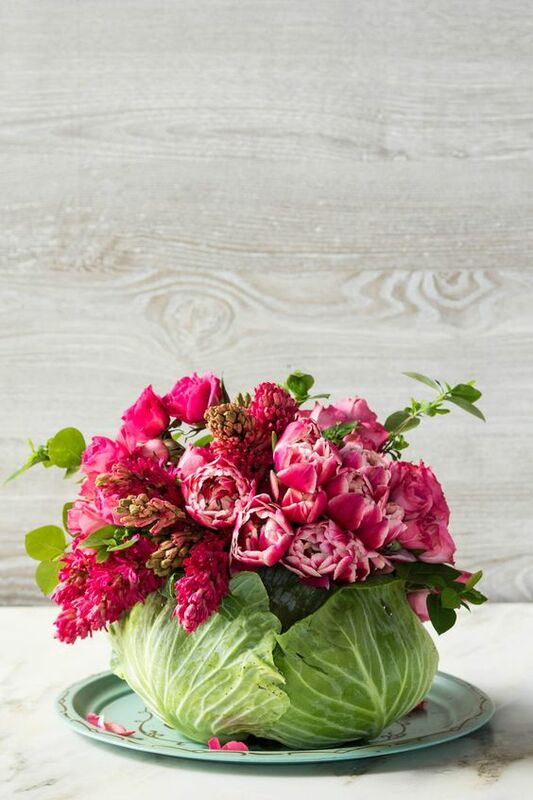 Impress your guests with this fun arrangement which is actually the simplest DIY idea you can try this year. Use colored eggs atop wheat grass flats in wooden boxes to give the dinner table a bucolic vibe. To balance the earthiness with delicate use whimsical elements like rings, pastel colored place mats, floral napkins and dinner ware having an intricate beaded motif. 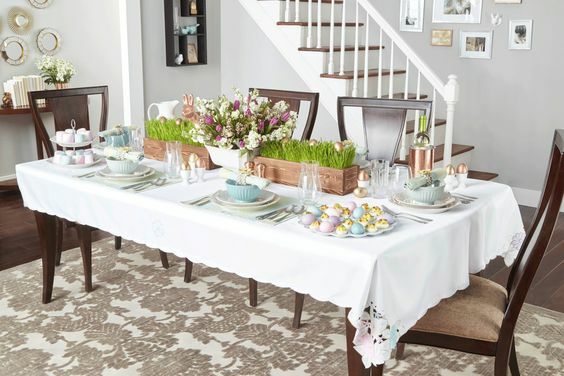 Celebrate the spring’s natural beauty and Easter hand in hand with a homemade Easter dining table center piece that stars the most beautiful flowers of the season. 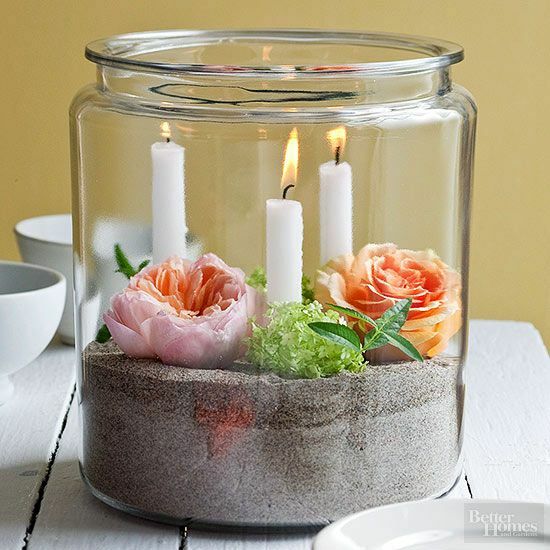 For this idea, you will have to fill a glass canister half way with sand and then insert candles and flower stems. Moisten the sand or use floral picks for long lasting blooms. This idea is a perfect option for kid’s dinner table where the tiny guests can pluck treats for themselves from this tree whenever they want. 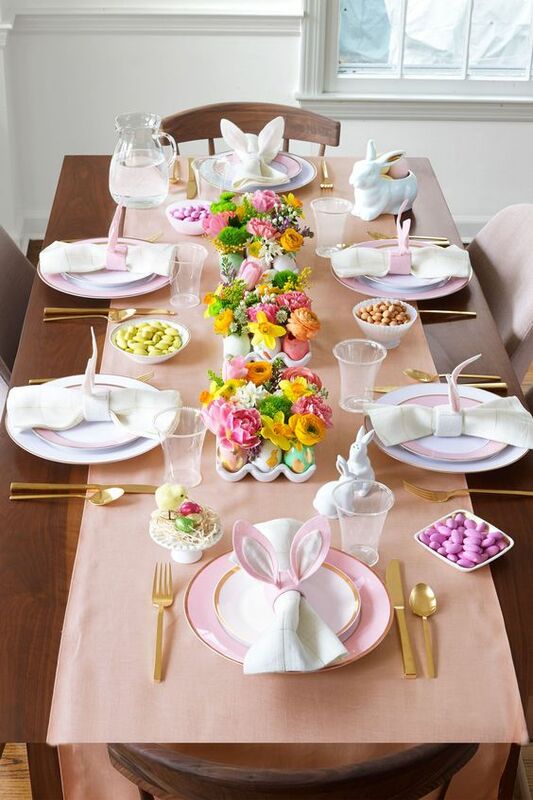 The Easter table will surely take an advantage of easy to arrange lavender center pieces along with brass accents which includes candlesticks, places card holders and bunnies. If you do not have any brass accessories then use a can of gold spray paint. 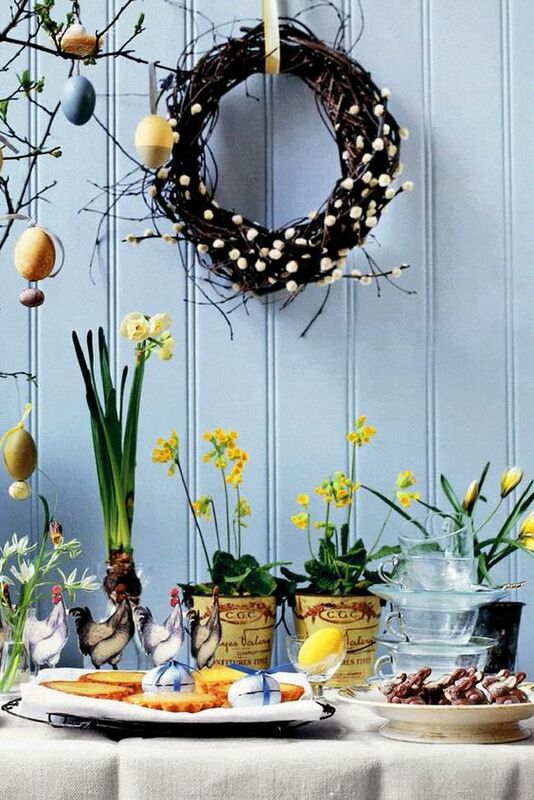 The natural looking Easter center piece teams up with wooden eggs, a bit of paint, some moss and a trifle dish. You just have to coat wooden eggs with a single coat using 3 paint colors and let it dry. Once done, add the eggs to a trifle dish and set the dish on the dining table or you can also use a wooden serving platter. Use extra eggs and bit of moss to surround the dish. Using varied vessels and vases along with a cake plate display, your dining table will be able to balance between laid back and dressy with this décor idea. 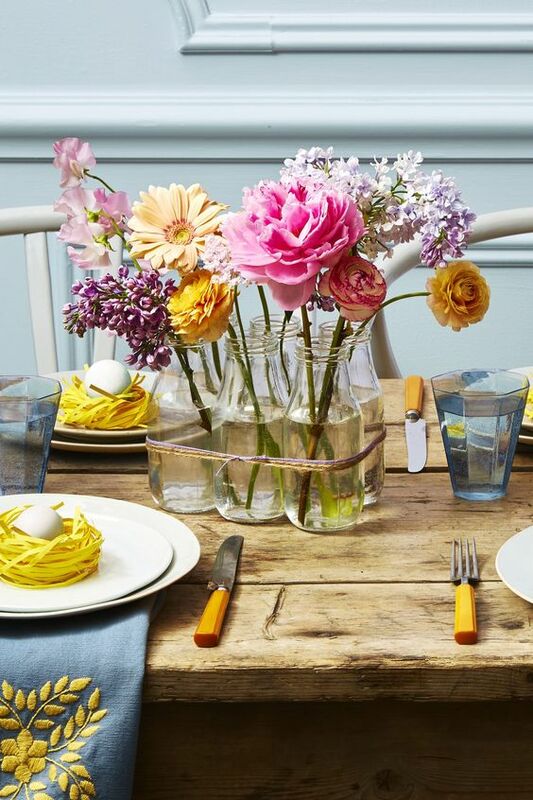 With this dinner table idea, keep the Easter settings cheery yet simple. 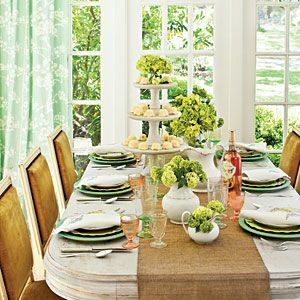 Use a flowery plate on a solid color place mat along with tinted glass and loosely tie a ribbon around a cloth napkin. Add a gold painted wooden Easter egg for the final and finishing touch. IF you are fond of sticking to your favorite general color groups then you can play with patterns and shades with your utensils and table linens. 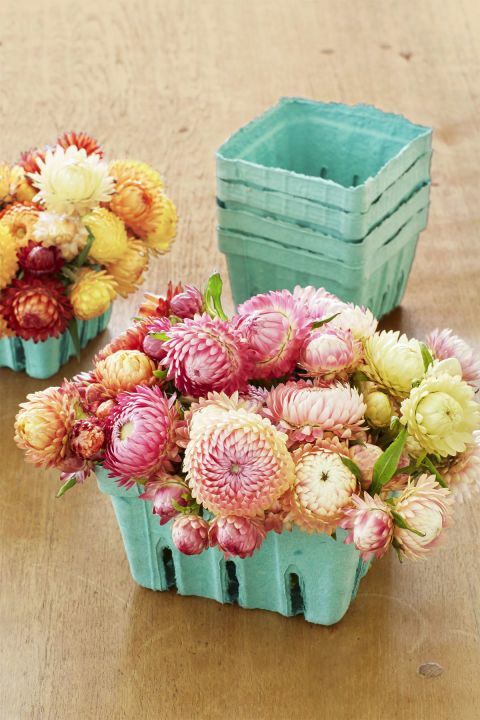 For a single flower arrangement, you can use card board berry baskets and use them to add small bursts of color to your Easter dinner table. 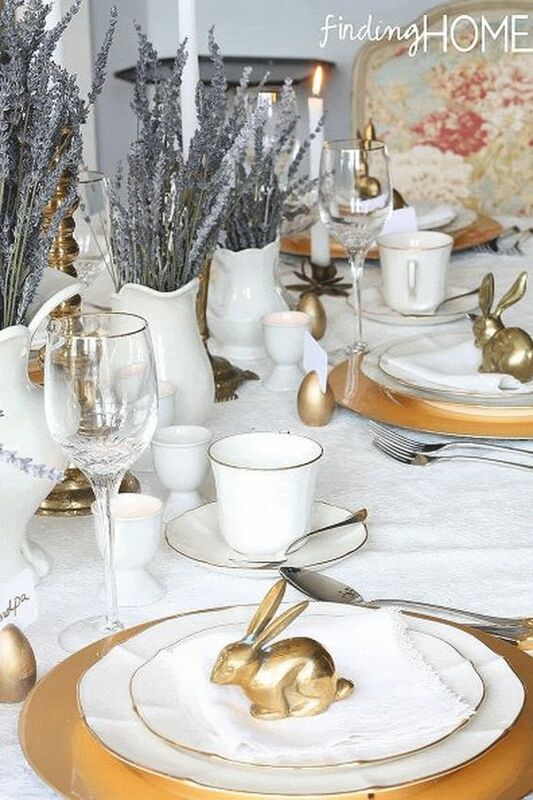 Rather than using traditional bunnies, use stylish bird theme for your Easter dinner table. Try using light blue plates with complementing pink place mats and break the color palette with lacy edge white napkins. For the center piece, you can use a nest of dried moss in a bird cage with pink blossom and pink ribbon to match and give a finishing touch to your setting. It is a DIY arrangement which you can do with the help of kids too. It is a perfect idea for implementing on kid’s table. Simply fill it with Easter eggs along with other treats for the kids to find out. 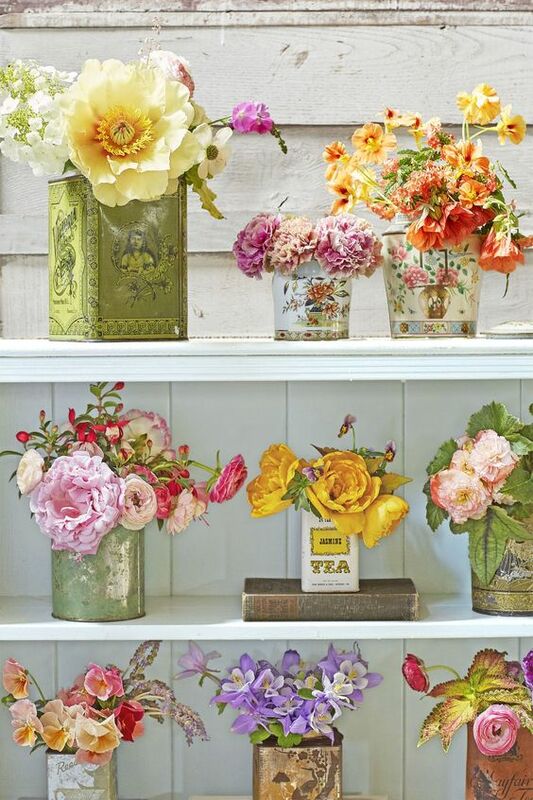 For this dinner table idea, use old tins of tea and fill them with eclectic group of bouquets and display it on your dinner table. 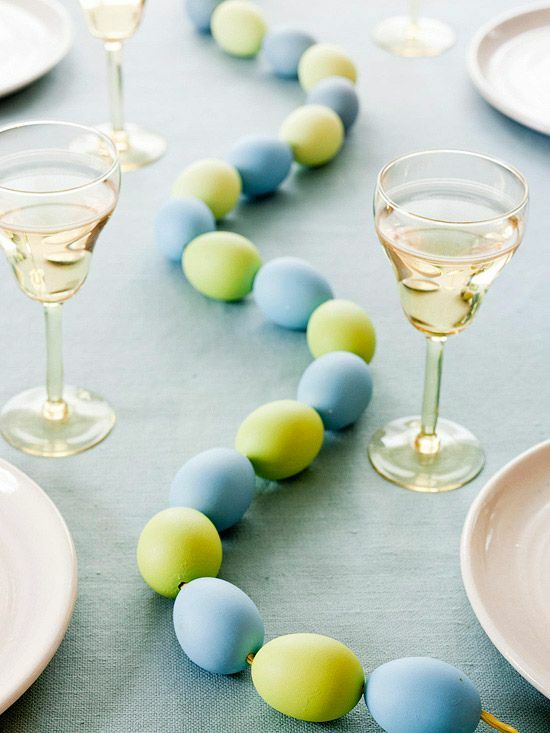 Create a beautiful garland with green and blue Easter egg garland rather than a common Easter runner. Using a push pin, make a hole in each end of the egg to blow it and then push a wooden skewer through one end to enlarge the hole and break the yolk. To push out the yolk and the white, blow in the smaller hole. Threaded with a narrow ribbon, use a bead making needle to connect the eggs to display on your dining table for the Easter. 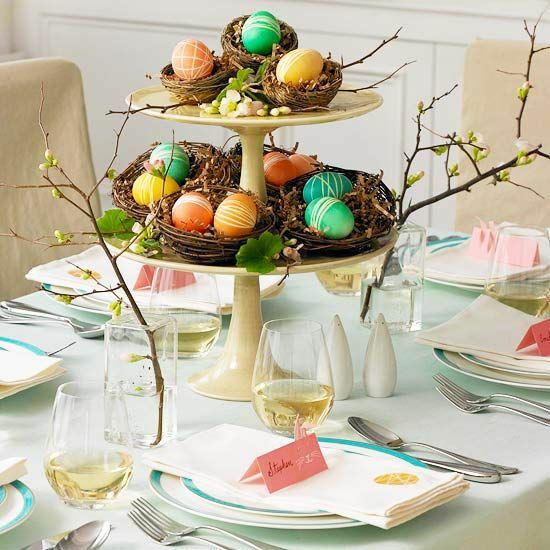 For your dinner table, a two tier dish with Easter egg filled nests will be a wonderful option to try this year. 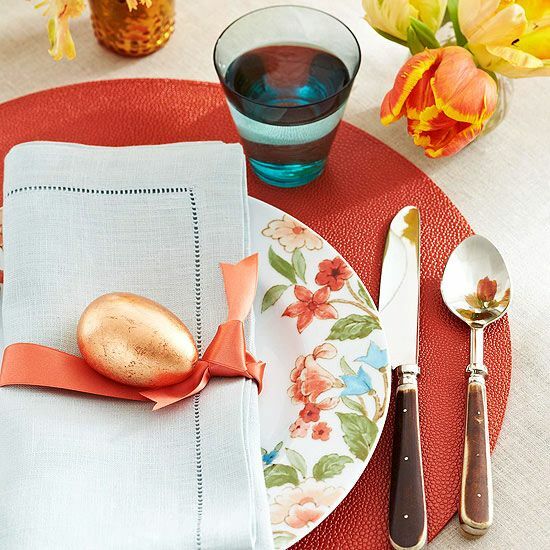 It is easy to make and will complement the bold colors of your table’s center piece with a single color name card and napkins with an Easter egg pattern. 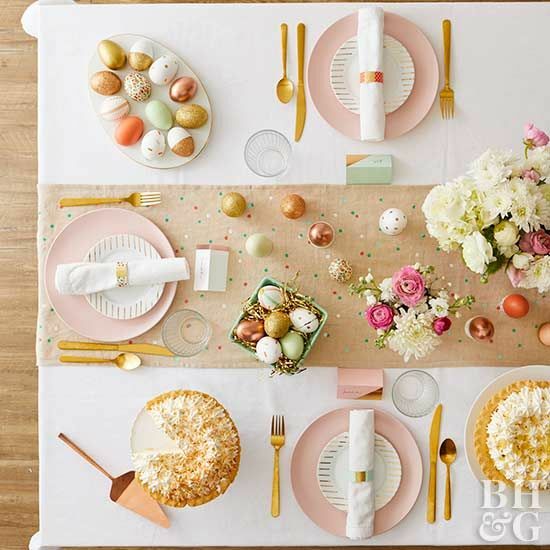 Here ends the list of our 2019 trending Easter dinner table ideas. Try them out and enhance your creativity and DIY skills. If you have some ideas of your own then try mixing them with the ideas mentioned above to create something more unique and impress your guests with your creativity. You can also use more than one idea by mixing them as per your likes and surrounding to match up the décor.